A quality arrester starts with a quality disk. A quality disk starts with quality raw materials and a solid design. The size of a disk does not indicate quality in any way if it is applied correctly. The disk in Figure 1 is a distribution class disk rated about 4kV MCOV. It consists of the following components: an aluminum top and bottom called the electrodes; a glass surface along the outside diameter called a collar; and, on the inside, an N-Type semiconductor material. the raw materials are also significant factors. A consistent quality disk can only come from raw materials that have continuous analysis and control. The varistor mixing, drying, pressing, and sintering processes are generally proprietary in nature, and for good reason; the development of the varistor was expensive and took years to refine. Disk quality is highly dependent upon this fabrication process, so users interested at this level are encouraged to visit the supplier for a firsthand explanation and demonstration. microstructure is defined as the configuration of the ZnO grains at a .1 to 100 micrometer scale. 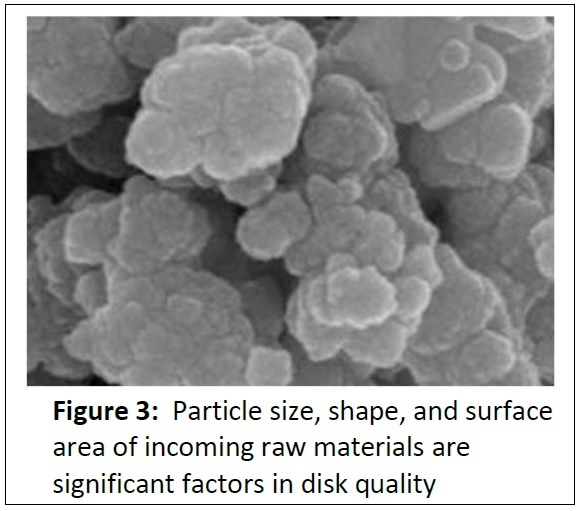 Figure 4 shows a typical microstructure from a good quality disk. Of course, each supplier of quality arresters may be a bit different, but controlling this microstructure on a routine basis is important in quality disk production. very high quality level. This is a destructive test, and the disks are not useable in an arrester. If the disk should not meet the pass criteria the failure mode can tell a great deal about where the process requires adjusting. Figure 5 shows a disk that has failed the High Current Impulse Test. Thermal sensitivity of a disk is important to know because it governs how the future arrester will react to temporary overvoltages during the course of its lifetime. As part of the quality testing, each disk or representative sample of disks has its thermal response checked. This is done in numerous ways, but in simple terms, the disk is heated and then energized to determine how its resistance has changed. Since all modern varistor material is thermally sensitive, knowing how it reacts before it is assembled into an arrester is high on the critical check list of a quality arrester. Figure 6 shows how temperature changes the characteristics of a disk. It is imperative that a temperature rise of 100°C does not move the characteristic too far to the right, or it will not perform properly during the inevitable overvoltage event. When the ZnO varistor was first introduced to the surge protection industry in the late 1960s, the formulations were very young, and the understanding of how a varistor changed its characteristics over time was low. Since then, varistor composition formulations have matured and the production of a stable device is a well understood process. However, should the production process deviate for whatever reason, the long term stability of a disk may be affected. This potential effect makes it necessary for continual monitoring of the long-term leakage current stability. Every supplier of good quality arresters performs this important test on its disks on a routine basis to ensure that a stable high quality arrester is produced. The Institute of Electrical and Electronics Engineers (IEEE) standards do not require routine tests on disks; however, they are absolutely necessary to ensure a high-quality arrester. The routine tests often consist of three measurements at room temperature. Impulse: 8/20 current impulse at a nominal current. From this impulse, the clamping or discharge voltage of the disk is measured. Reference voltage for 1mA voltage: This measurement determines the MCOV rating of an arrester. Leakage current: This measurement determines what the watts loss will be at MCOV when installed in an arrester. The routine tests are performed on every disk by quality manufacturers. In essence, every disk is impulsed by a simulated lightning surge to assess its surge performance. It is also evaluated at operating conditions to ensure that only the best and appropriate disks are used in the quality arrester. All three of these measurements help the manufacturer give the disk a usage category for assembly into an arrester. In addition, these tests provide a good basis for statistical process control. A supplier of good quality arresters knows at all times where the process is operating relative to its upper and lower limits. Typical readouts are shown in Figure 7. 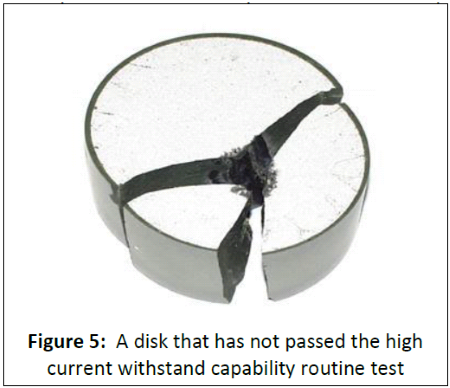 Even though the disk is an electrical device, its physical condition can influence future arrester performance. Cracks, chips, and blemishes can all affect its surge durability. 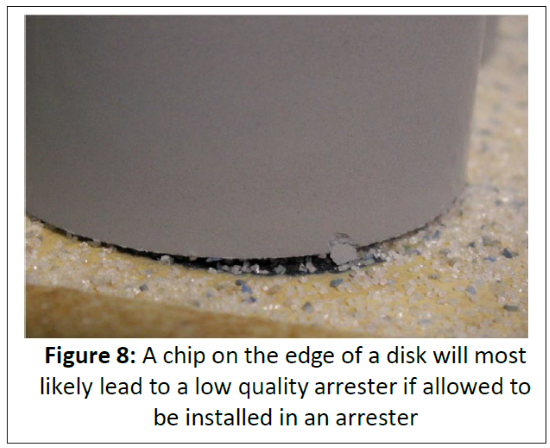 In Figure 8, a chip on the disk prior to sintering was caused by an impact on its edge. This type of defect early in the process will likely lead to a low-quality disk and one that should could not be part of a good quality arrester. Good disk suppliers will have inspection systems in place that will make sure this type of defect is not used in an arrester. A good quality arrester starts with a good quality disk. The disk is clearly the most complex component in any arrester and must be produced to a very high standard for it to be included in good quality arrester. This article has been sponsored by members of NEMA Section 8LA, who invite you to visit their facilities to witness quality first hand.